The beginning of the film (following the title sequence) resembles the short story, in which Bond has to act as a counter sniper to protect a defecting Soviet. The film begins with Bond investigating the deaths of a number of MI6 agents. The Soviet defector, Georgi Koskov, informs him that General Pushkin, head of the KGB, is systematically killing Western operatives (British and American spies). When Koskov is seemingly snatched back by the Soviets, Bond follows him across Europe, Morocco and Afghanistan. The film was produced by Albert R. Broccoli, his stepson Michael G. Wilson, and his daughter Barbara Broccoli. 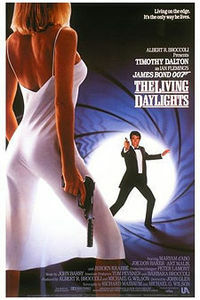 The Living Daylights was generally well received by most critics, and was also a financial success, grossing $US191.2 million worldwide. It was the last film to bear the title of a story by Ian Fleming until 2006’s Casino Royale, 19 years later.